The other Canadian Ironman distance race taking place at the weekend was Challenge Penticton, formerly Ironman Canada. A different name, but a longer history of results to examine. The big difference this year was the lack of entrants; as a new brand to North America and without the draw of Kona slots Penticton brought in fewer competitors than before. 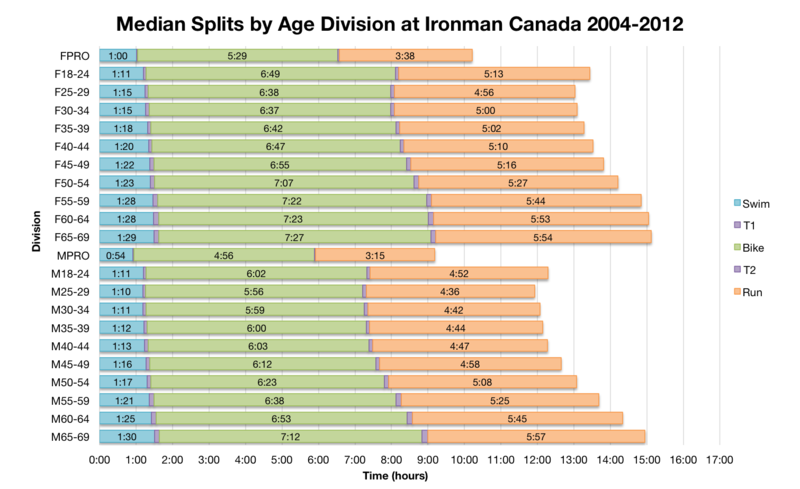 This thinning of the field, as shown in the table below, did impact the pattern of results on race day. 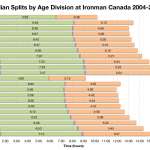 For contrast Ironman Canada in Whistler lists 2171 athletes in the Athlete Tracker, lower than the brand’s peak numbers, but three times that of Penticton. 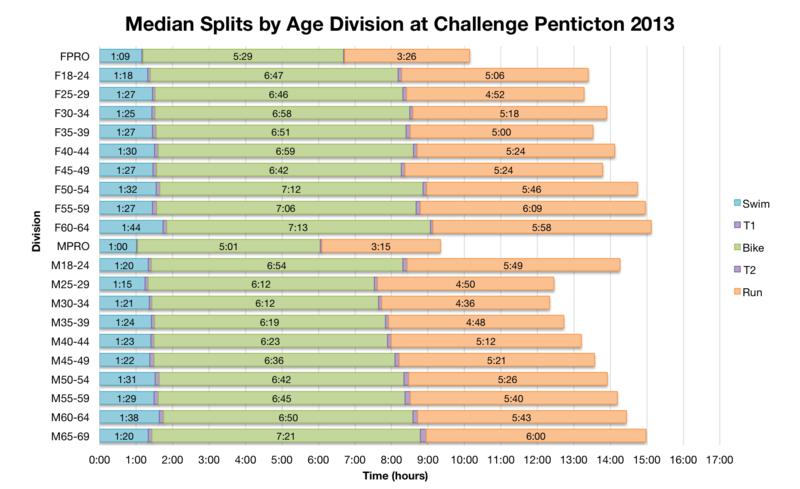 Comparing this year’s distribution of splits with previous results at Penticton the differences are obvious – at every stage of the race we see slower times. 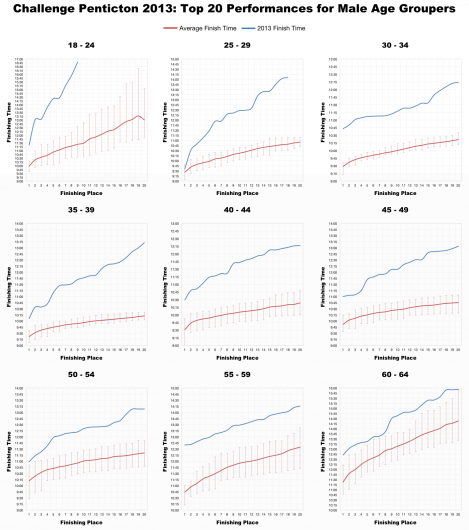 Times were likely impacted by a hot day which will have reduced performances, but rather than a large increase in slower athletes it appears that many of the fastest age groupers were missing from this year’s race, thinning the front of the field and putting more weight to the middle and back of the race. Comparing the medians offers a similar picture of the race. The swim was definitely slower in both the pro and the age group field we see a relatively large change in the results. Perhaps the consequence of the smaller field, but equally likely to be a result of conditions. 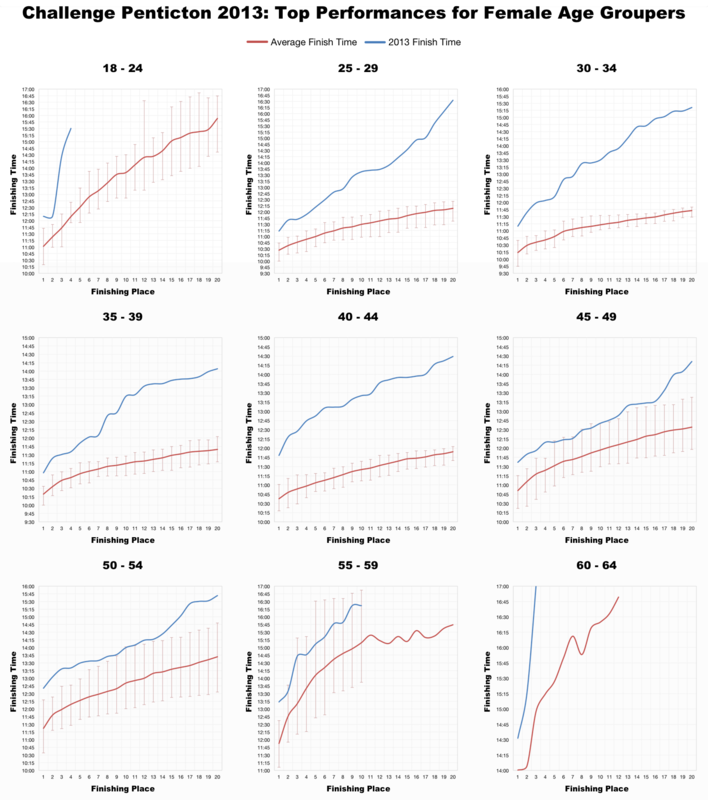 Bike and run were also for the most part slower, but not universally. 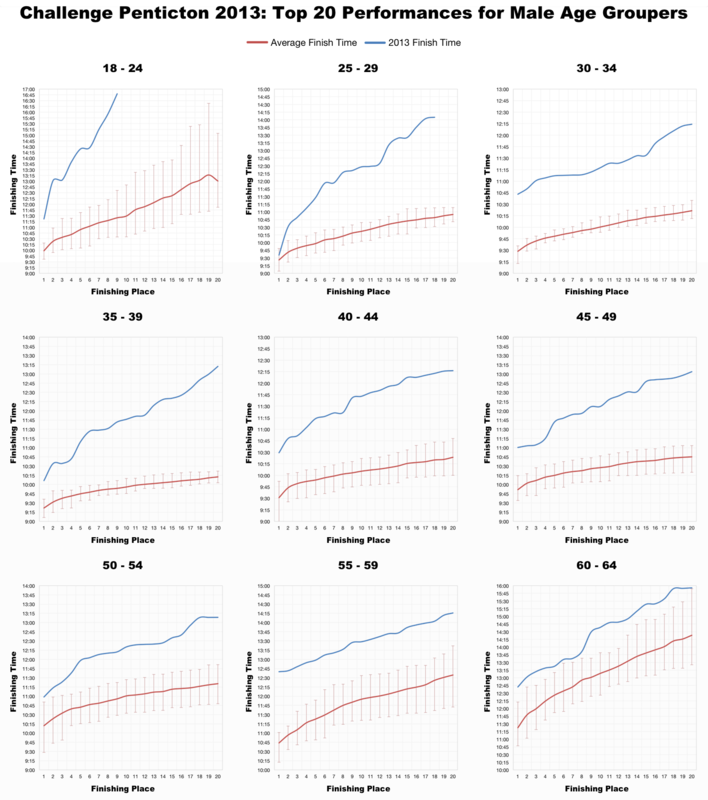 Of note is the relatively small change in the professional splits which may suggest that while conditions were a factor the size and strength of the field played a major role. 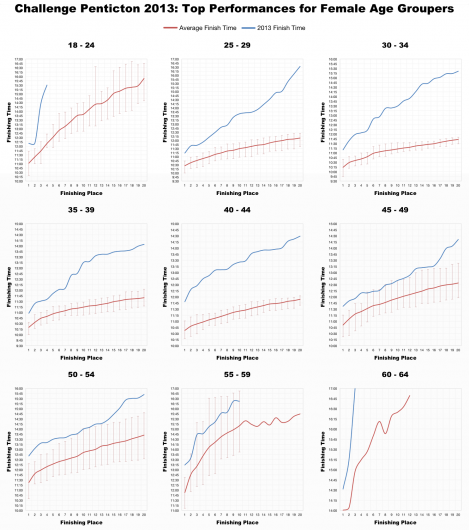 Perhaps the clearest indicator of change is the shift in the top 20 age group results – across the board times were much slower this year, often by a factor of an hour over the previous average. Conditions may have been tougher, heat was likely a factor in slower times, but it would take significant changes to have this level of impact and we’d expect to see that reflected even more strongly in the split and distribution data. I’d speculate that the fastest age groupers usually present in Penticton had opted to chase the generous allowance of 100 Kona slots in Whistler or to try out a new course. Consequently times for the podium were generally much slower than previously seen. A different year for Penticton’s Ironman distance race without the Ironman brand name and the enticement of Kona slots. Challenge struggled to fill the race, being placed head-to-head against the new Ironman Canada in Whistler can’t have helped. Hopefully the next few years will see this race draw back bigger fields and attract a wider range of athletes.